This new set of Chinese-built mics offers good-quality vocal and instrument recording on a budget. CAD have carved out their own niche in the microphone world over the past few years with some very fine mid-priced studio mics. However, with these new Chinese-built models they seem to be trying to take a share of the entry-level market as well. The mics are available in a number of different kits (complete with shockmount and pop shield) or individually. The smallest of the three mics under review here is the GXL1200, a conventional end-fire 'stick' mic featuring a cardioid capsule a little over half an inch in diameter, a FET preamp, and a transformerless output stage. Its response is nominally flat from 30Hz to 20kHz, with very slight dips in the 3-7kHz region and a modest presence peak at around 9kHz. The quoted -56dB sensitivity and equivalent noise figure of 14dBA are slightly better than average in this UK price range. Phantom power is required, but can be either 24V or 48V. The casing is nicely machined and the capsule itself may be unscrewed, suggesting that alternative capsules may become available. The GXL2200 is a side-address cardioid capacitor mic with a one-inch centre-terminated diaphragm, a FET preamp, and a transformerless output stage. The frequency response is from 30Hz-20kHz, with a few ripples below 200Hz or so and a 1dB presence peak mainly in the 12kHz region. 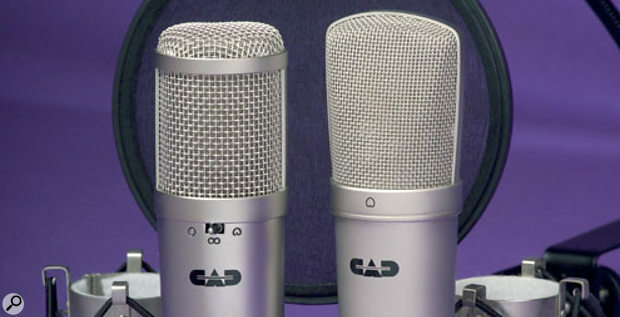 Both the large-diaphragm mics require 48V phantom, and they also share a maximum SPL figure of 135dB and an equivalent input noise of 20dBA, the latter a little on the high side for modern mics, but still not a cause for concern in close-up studio applications. The GXL3000 is a large-diaphragm, side-entry mic designed primarily for studio vocals, though, as with most such mics, it also does a fair job on most instruments. Its one-inch centre-terminated capsule has a switchable polar pattern, giving cardioid, figure-of-eight, or omni variants. Unscrewing the end cap allows the body cover to slide off revealing the familiar 'everything fixed to two rails' Chinese internal structure — there's nothing unusual in here, but also no cause for concern as regards mechanical integrity. The metalwork seems to be acoustically quite well damped too, which can be important in keeping the tone as clean as possible, and the basket has a dual-layer structure to improve its effectiveness as a wind shield and electromagnetic screen. On paper the mic has a 20Hz-20kHz frequency range, with modest presence peaks at around 6kHz and 12kHz. Low cut can be engaged to compensate for the proximity bass boost when the mic is used close up in cardioid or figure-of-eight modes, and a 10dB pad is available for when you're recording very loud sources that might otherwise overload the mic preamp. Overall, the mic weighs 602g, which is substantial without being too challenging for the shockmount swivel joint. One GXL1200 mic with mounting clip, one GXL2200 mic with shockmount, and an EPF15A pop shield. GXL2200 Stereo Studio Pack, £193.25. A pair of GXL1200s with mounting clips, one GXL2200 with shockmount, and an EPF15A pop shield. One GXL1200 with mounting clip, one GXL3000 with shockmount, and an EPF15A pop shield. GXL3000 Stereo Studio Pack, £276.21. A pair of GXL1200s with mounting clips, one GXL3000 with shockmount, and an EPF15A pop shield. Despite the noise figures of the two large-diaphragm mics, none of these mics generated any noticeable noise during normal use, and their tonal qualities also didn't disappoint. The GXL1200 has a fresh, open sound that works well with just about any instrument, though it also produces a nice vocal sound when used with a pop shield. It's good on acoustic guitar, but seems to be able to wring detail out of just about any instrument, especially percussion. As a vocal mic, I rather liked the no-frills GXL2200, as its more pronounced presence peak is high enough to create a sense of air and intimacy without making the upper mid-range sound harsh. It adds a nice gloss to vocals and also does a creditable job on acoustic guitar. Used fairly close, the proximity effect gives a plausible 'radio DJ' character to the low end of the voice. Although there is nothing much to differentiate this mic from dozens of similar Chinese-built models, it's certainly capable of making excellent-sounding recordings. The multi-pattern GXL3000 sounds pretty neutral, which is perhaps what you'd expect after seeing the nominally flat frequency plot with its subtle presence peaks. The omni mode sounds more open and natural than the cardioid and figure-of-eight modes, as is to be expected, but overall the sound is smooth and fairly classy with no obviously hyped characteristics, making this a good choice of mic if you need to use it as an all-rounder with different singers and different instruments. While these mics may differ little from other Chinese-built models, they perform very well within their price range, and the kits are a nice idea, as they provide everything you need to get going, other than mic stands and cables. The kits offer plenty of flexibility for vocal and instrument recording, though the GXL3000 kits are clearly more versatile because of the GXL3000's ability to switch patterns. The GXL3000 is also the most natural sounding of the mics, though the GXL2200 has a nicely flattering quality to it especially at the high end. I'd have no qualms about using any of these mics to handle a serious recording project, but as always I'd first ensure the mic suited the singer. Project studio owners today are very fortunate in being able to buy such credible microphones at such affordable prices, from a variety of manufacturers, and though you still get better quality when you pay out more money, the difference isn't always as large as you'd expect, and in many cases the recording conditions have a greater influence than the specific microphone used. Comprehensive kit contents, including shockmount and pop shield. No cons as such, though there are lots of very similar mics out there vying for your money. 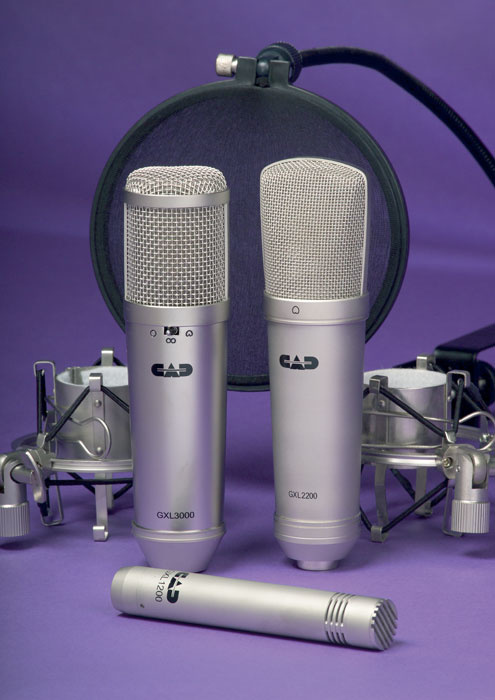 These CAD mics offer a cost-effective means for any project studio owner to get kitted out to make high-quality vocal and instrumental recordings. The kits are also good value and, although you don't get any fancy camera cases with the kits, you do get shockmounts and pop shields as standard. See 'Options & Pricing' box.